It's time to take your first steps into the world of improvisation as Rockschool examines the solo section of its Grade Three piece, 'Download'. Pick up Total Guitar issue 217 (on sale 8 July to 4 August) for the accompanying tab and explanation. 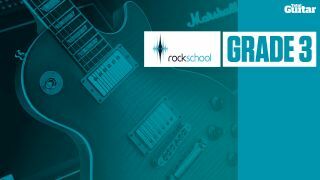 You'll find the full track, backing track and tab for Rockschool's Grade Three piece 'Download' below. Clicking on the links will stream the audio files in a new window. Alternatively, you can download them all by right-clicking and choosing 'save as' or 'save target as', depending on your choice of browser.